Megadyne Medical Products, a full-solution electrosurgical equipment and accessory developer and manufacturer, has announced the availability of its new E-Z Clean precision blade electrodes. E-Z Clean non-stick electrodes feature a polytetrafluoroethylene (PTFE) coating that reduces eschar build-up and smoke during surgical procedures, enabling surgeons to achieve consistent cutting and coagulation. 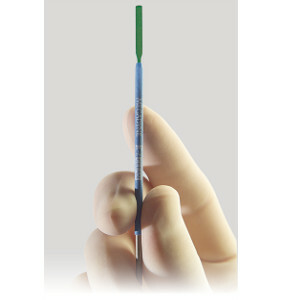 The product can remove a potentially dangerous sharp needle from the surgical field, Megadyne Medical claims. The smaller blade width of E-Z Clean precision tips allows surgeons to reduce power settings for work in very small spaces. In addition, the device also reduces risk of collateral tissue damage when compared to standard electrosurgical tips. Megadyne Medical marketing vice president Mike Hintze noted the company is continuously looking for new product designs that provide surgeons with more control, flexibility and safety features. "We designed the precision tips to provide directional cut capability that a needle’s non-directional geometry is unable to provide. Available now, the E-Z Clean precision electrodes are offered in lengths of 2.75" and 4" and with or without extended (modified) insulation. "PRECISION electrodes are a cost effective way to provide surgeons with quality E-Z Clean PTFE non-stick tips and eliminate a potentially dangerous sharp needle from the surgical field," added Hintze. Megadyne Medical claims that the EZ-Clean precision blades expand the company’s offering of specialty electrodes for precise cases.